Trump Congratulates Guam's Governor Because The Nuclear Crisis Made Him "Extremely Famous" [VIDEO] - Joe.My.God. President Trump phoned the governor of Guam on Friday to assure him all the residents of the Pacific Island are safe. A video shows Gov. Eddie Baza Calvo laughing and joking with the president as they discuss everything from the readiness of the US military to tourism. 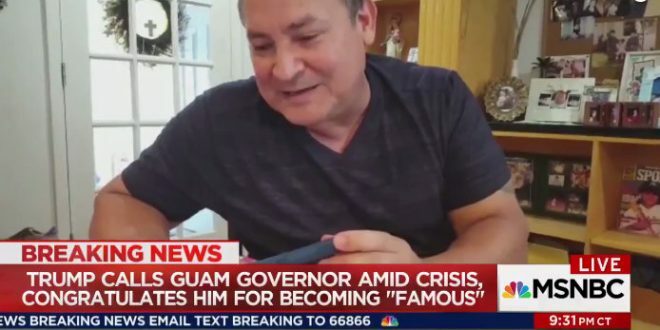 Now Trump calls Guam’s Governor to congratulate him on becoming famous because of North Korea. Sick obsession with notoriety. Unfit.